In the last several months, I've spent a lot of time with my brother, Wes, my sister-in-law, Brandie, and my nephews, Emerson and Owen. Emerson is now four and has a long, well-documented history of a fascination with airplanes. Owen is now two. One Friday a few months ago, they all came and stayed over. Saturday morning looked like a nice day, so I asked if they wanted to go to the airport. The answer, predictably, was yes. They LOVE going to the airport. Em and Owie think the DC-3 owned by Remote Area Medical (RAM) is a bomber, and they love to go see it. There was even a Saturday when they had stayed over and Emerson woke up early, so he and I went to the airport and sat in the Tiger for a while. Despite his fascination with airplanes, however, Emerson has never wanted to go for a flight. The most he's ever done was ride in the airplane while I taxied it around with Em and Brandie. On this particular Saturday, we went to the airport, looked at the airplanes, and pretended to fly. Owen loved it just as much as Em, at least as long as he had Scruffy with him. Then I asked, for maybe the 100th time, "Hey, do you guys want to go for a ride?" Em immediately said no, but to my surprise, Owen said yes. This prompted Em to reconsider and also say yes. I jumped on this opportunity as quickly as I could, and started doing quick weight and balance calculations. Fortunately, the Tiger's gas tanks were not full, and we could fly within limitations. Emerson helped me get everything ready. Then he settled into his car seat that I had securely strapped into the back of the plane. Owie was young enough that he could sit on his dad's lap. Brandie climbed in back with Emerson. We put headsets on the boys, but they were way too big. I took off and we flew around for 5 minutes. The air was smooth, but the visibility was not all that great. Em's headset kept falling off, so he finally gave up and didn't put it back on. He seemed to enjoy the flight, but he kept a firm grip on Brandie's hand. I wanted to keep the flight short to avoid any possibility of the boys becoming scared, so after only 5 minutes or so we turned back to the airport and landed. Man, I do love my nephews. 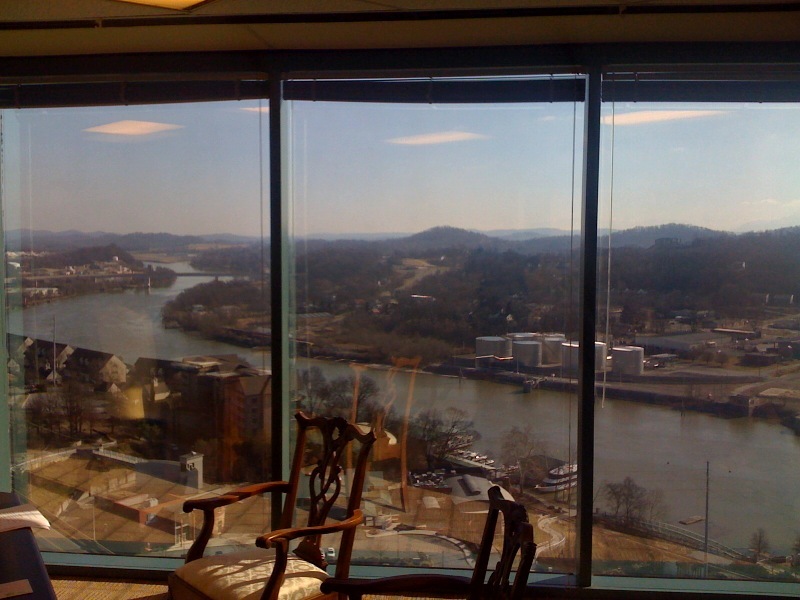 We moved from the Washington, DC, area to our new home in Knoxville, Tennessee. It's a completely new environment, new home, new airport, new geology. Instead of the Chesapeake Bay and Blue Ridge Mountains, it's the Tennessee River, innumerable lakes, and the much-higher Smoky Mountains. The sprawling metropolis of DC has been traded for a city less than one-tenth its size, and my commute went from about two hours a day to ten minutes. 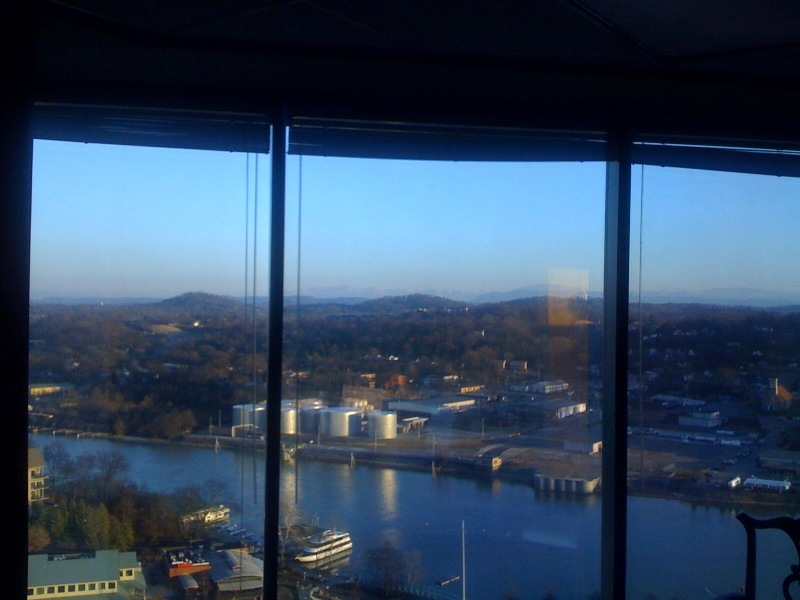 I spent the first month in my new office staring out the windows, at the Smoky Mountains in the distance and the Tennessee River in the foreground. When I look upriver, I can see my new airport. 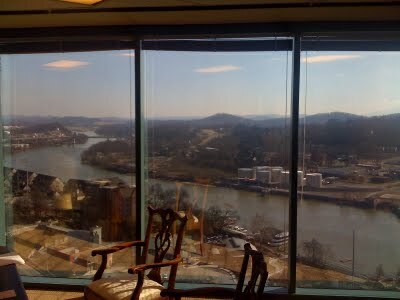 The Knoxville Downtown Island Airport (KDKX) is on an island in the middle of the Tennessee River. Airplanes taking off on Runway 26 climb out over the river toward my office. All of this made it very hard to "suffer" through the long period of time I was waiting for the Tiger to be fixed and delivered. I had delivered the Tiger to Hortman Aviation on December 1st, and it wasn't until January 10th that it was finally delivered and available for me to fly again. On that day, it was beautiful, clear, and calm. The Tiger had been delivered the day before, and I was dying to get in the air. I left work early and headed to the airport, calling ahead to have the airplane pulled out for me (more on that later). I taxied the airplane over to the self-serve fuel pumps and filled it up, pausing to take a picture of the city skyline. The middle of the three tall buildings in this photo, the second-tallest one, is where my office is located. I took off and headed southeast to fly around and "get the feel" of the airplane again. It was sweet. It felt like I hadn't lost anything in six weeks of being ground-bound. Then I headed back and started doing touch-and-gos. As the Tiger climbed up toward the west after one touchdown, I caught the sun just as it was setting. The Smokies faded with the light as I continued around the pattern. 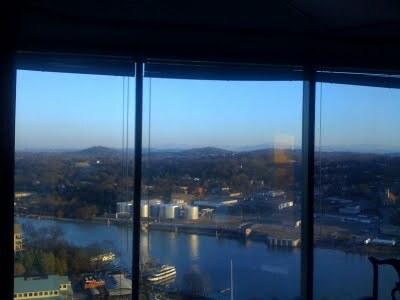 The sight of the Knoxville skyline reflecting the sunset caught my breath as I climbed out once again over the glassy Tennessee River. A few more landings later, the Tiger and I felt firmly reunited. I called the FBO to put the Tiger away and slowly drive the half-mile to our new home.